I’m very pleased to be able to let you know that Lea‘s hip seems to have completely healed. Praise God, we went for her check up, and the xray shows no sign of the fracture! The doctor wants her to take a couple of rehabiitation sessions, mostly to help her use the cane again . . . she was pretty apprehensive, but overcame that real quickly with the therapist’s assistance. Her leg shortened somewhat, so her balance is even worse than before, although, quite honestly, she had been off her leg long enough for all the pain in her knee to subside. Some blessings come in disguise, don’t they? She is reducing the amount of pain killer she is on, and is now down to two 2-milligram doses a day . . . half what she had been taking. She is back walking on the cane, but still using the walker so she doesn’t get her knee all inflamed again. We went upstairs at Link’s today for the first time since she broke her hip last November. The therapist had focused on retraining her to go up and down stairs with use of the cane and a “spotter’ to catch her in case of missteps. She can go up stairs pretty normally, but has to take a single step at a time coming down, because of putting full weight on the hip nd bad knee. 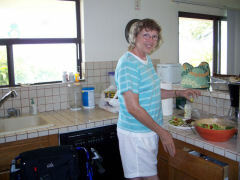 She was delighted to be in the kitchen again, and made us lunch from leftovers in the fridge. We were tickled that Lyndi got home from school early and was able to join us. (Megan was off to a tennis match.) 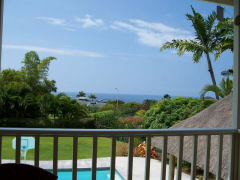 Lea particularly enjoyed the view from the lanai, where we had lunch, and she snapped the attached photo of the scene from where she sat. We have greatly enjoyed the church we have attended here is Hawaii, and our son and my brother and their families are very involved in the church activities. One of the very nice things the church does is provide an ‘Aloha table” for its members. Many folks here have fruit trees in their lawns, and bring whatever excess they have to the church, and share it with members via the aloha table, at no charge. 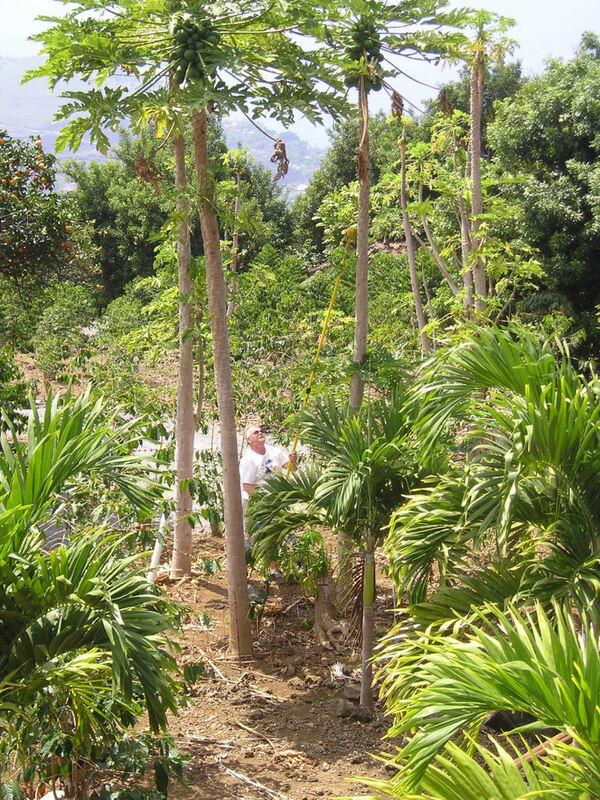 Bill and Jane Buckingham operate the Sacred Grounds Coffee Farm, and have all kinds of fruit and nut trees . . . more than they can use, or harvest. They have allowed Lea and I to come down on Saturdays to pick as much fruit as we want to take to the church the next day. Lea takes pictures while I pick fruit. (That seems fair to her.) Attached is a photo she snapped of me picking papayas. I also picked five gallons each of avacados, pummelos (ancient grapefruit), and oranges. Their farm overlooks Kealakakua Bay, where Captain James Cook, who discovered these islands, was slain by natives. The fruit trees are at the top of the farm, near the houses, with the coffee trees below, and the macadamia nut trees at the bottom edge. In the mac nut trees is a very nice, quiet, spot where I like to take a break from the sun, and share a few quiet minutes with the Lord amid the beauty of His creation. The farm is a very attractive and touching place, made even more precious by the folks who own it. Lea continues to make good progress, although she is still relying on too much pain killer (in my opinion), to the point she doesn’t yet want to check her email or work on writing on her memoirs, which she started before her illness in Hartford. I am really anxious for her to come on out of that protective fog, but realize that she is still dealing with a tremendously traumatic blow to her sense of self, and that is going to take a while. Hopefully, when we return to Indiana we can get her abdomen closed up and then get her knee surgery completed. The case worker at the insurance company is working to find surgeons for her in Indiana, but isn’t at all willing to discuss going back to Hartford. So, we are probably going to be spending the next couple of years in Indiana getting surgeries and doing recovery. Then, we’ll see. Thank you again to each of you who have been so supportive over the past months. We send you our love, and look forward to seeing you again in the very near future. We pray for God’s richest blessings for you.